Another awesome contest organised by the awesome Nuffnang! yup, never tired of participating lor since the rewards are always killer. hahaha..ampu lebeh tauw~ hey, i am so serious! now, what is this all about? As the tittle mentioned, they are calling out for the food lovers a.k.a food bloggers who later will be called as Tastebuddies! yup, they gonna recruit only 20 bloggers and this clan will be the pioneer members of a new Nuffnang Facebook Interest Group, "Tastebuddies" which is exclusively by invitation ONLY. Why you should be anticipated upon joining this group?? check below quote which has been copied from Tastebuddies@Nuffnang. The perks and privileges of joining Tastebuddies is that members will be given priority when there are events pertaining to food, such as review sessions, product launches or cooking workshops (just to name a few). Besides that, Nuffnang will also organize monthly gatherings and other activities exclusively for Facebook Groups members too! Oh My Gosh, i always dreaming of getting the invite alias FREE FOOD TESTING from any restaurant / cafe since all this time, i've spent my own money to get the food and sweating to write the review of it WITHOUT GETTING ANY PAYMENT! hahahhaha...look, i am toooooo kind-hearted indeed...! 1 - Write a blogpost with the tittle "Tickling My Tastebuds"
3 - Describe the food & the experience of it. 4 - Then, submit the post in HERE. So, here is mine. yup, the photo is credit to myself and also should claim that, my best skill is photographing the food instead of people / other moving things! 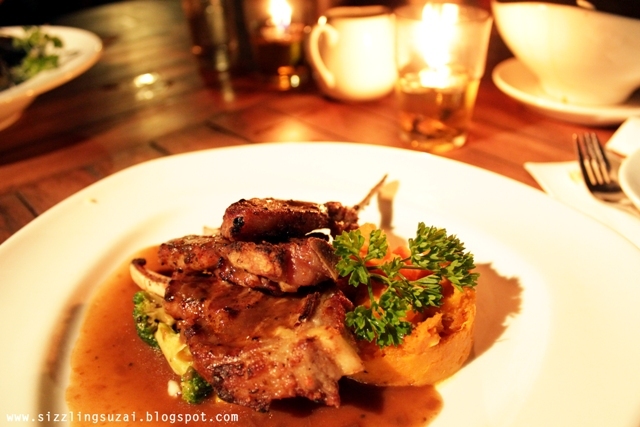 hahaha..
Everytime i look at a steak & grill menu list, the grilled lamb would always caught my attention and my appetite! yup, it is my favourite steak ever and now, this Grilled Rack of Lamb is served at the Subak Restaurant, Bukit Lanjan which cost me RM58 per dish. Talking about the taste, firstly it was nicely cook, no less and not over cooked since i requested for a well-done finish. the meat is tender enough for you to chew a bit and ta-da just swallow it. once it go into your mouth, it easily melted and you can immediately taste the juiciness and the sweetness of the lamb which is absolutely tempting! 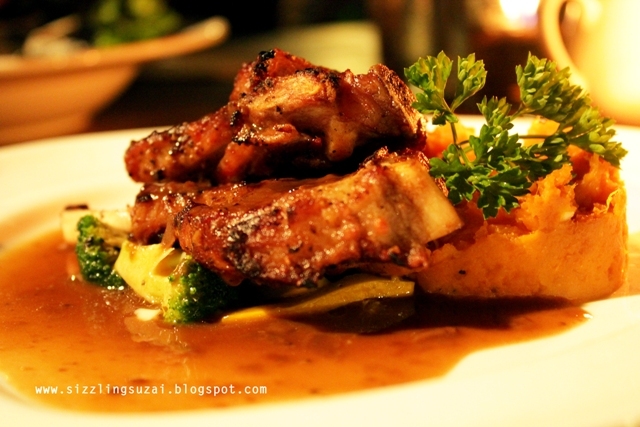 then, the black mushroom sauce is sticky enough and well-blended with the strong taste of the lamb. perfect combo! Well, based on the mouth-watering photo above, it was being served with the mashed sweet potato and a little veggies underneath the meat which for me is quite stingy lor~ heh heh heh...but thanks to the excellent taste of the grilled meat which i will never forget and should claim that this is definitely the BEST grilled lamb i have ever tasted. so, RM58 is really worthy! wahhh..looks yummy! i hope u get this sis..GOODLUCK! memang meleleh air liur je la pasni baca blog suzai....anyway, good luck!